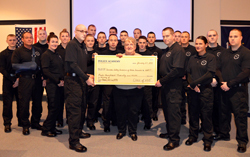 Recruits in the Cazenovia College Phase I Pre-Employment Police Academy presented a check for $420.00 to Ellen Guerdat, President of the Genesee Valley Chapter of Concerns of Police Survivors on Tuesday evening, January 27, 2015, in honor of slain New York City Police Department (NYPD) Detectives Rafael Ramos and Wenjian Liu. Genesee Valley Concerns of Police Survivors (C.O.P.S.) became a Chapter of National C.O.P.S. on July 22, 2008. It was started by survivors from Monroe County who belonged to WNY C.O.P.S. It was felt that there was a need to reach out to other survivors from other Counties and yet make it easy for all to attend the various programs and events without being too far for any survivor to drive. WNY and Genesee Valley C.O.P.S. continue to work together to ensure that the survivors, families and co-workers alike, receive the best services possible. Genesee Valley C.O.P.S. continues to grow along with our area of service and now services the counties of Broome, Cayuga, Chemung, Chenango, Cortland, Herkimer, Jefferson, Lewis, Livingston, Madison, Monroe, Oneida, Onondaga, Ontario, Otsego, Oswego, Schuyler, Seneca, Steuben, Tioga, Tompkins, Wayne and Yates. The Pre-Employment Police Basic Training Program at Cazenovia College is open to any resident interested in pursuing employment in a police department in New York State. Women and minorities are encouraged to apply. The program, operated through Cazenovia College’s Office of Extended Learning, is designed for current civilian or non-sworn personnel throughout New York State who are interested in entering the law enforcement field as police officers in New York State. Although the program does not guarantee admission into a police department, every standard required by a full-time basic police academy applies to this program, including physical fitness, attendance and academics. The Program was established in partnership with the Little Falls Police Department, with approval from the State Division of Criminal Justice Services (DCJS), in 2004. The Police Pre-Certification Program curriculum meets all requirements established by the Municipal Police Training Council. More information about the program is online at www.cazenovia.edu/police.